Before you read this post, start the playlist below. We had a particularly rainy weekend here in Philadelphia this weekend. Which meant that while I was cleaning my house and sourcing my closet for closet sale items I logged several hours on Netflix. It gave me a chance to finally check out the documentary “Bill Cunningham New York” all about famed New York Times photographer Bill Cunningham who captures uptown and downtown style all across New York City. As I watched, I added this documentary to my mental list of movies that every fashion girl (and guy) “must-watch.” It also inspired me to memorialize my mental list. This list is not, by any means, exhaustive and is could alternatively be called “my favorite fashion movies.” This list includes cult classics, documentaries, and movies that spawned some of the greatest fashion moments known to man. And no, “Gone with the Wind” is NOT on this list. Without further adieu, I present . . .
Cher, Dion, and the rest of the crew launched a complete lexicon, spawned a thousand look-a-likes, and introduced Azzedine Alaïa to an entire generation of teenagers. Aside from being one of the greatest Jane Austen adaptations of our time, Cher’s closet and the film’s 116 outfits make this film worth the watch! Unless you live under a rock (which, hey, do you!) you know that American Vogue’s September issue is one of the most important magazines issued each year. This documentary follows Vogue Editor-in-Chief Anna Wintour and her staff during the production of the 2007 September issue of Vogue. Appearances by the who’s who of the fashion world (designers, photographers, models, actors, etc.) pale only in comparison to watching both Anna Winter and Grace Coddington work. This is essential fashion viewing for any self-proclaimed fashionista. I LOVE this movie. I have seen it, at least, 100 times and there is absolutely NO shame in my game. 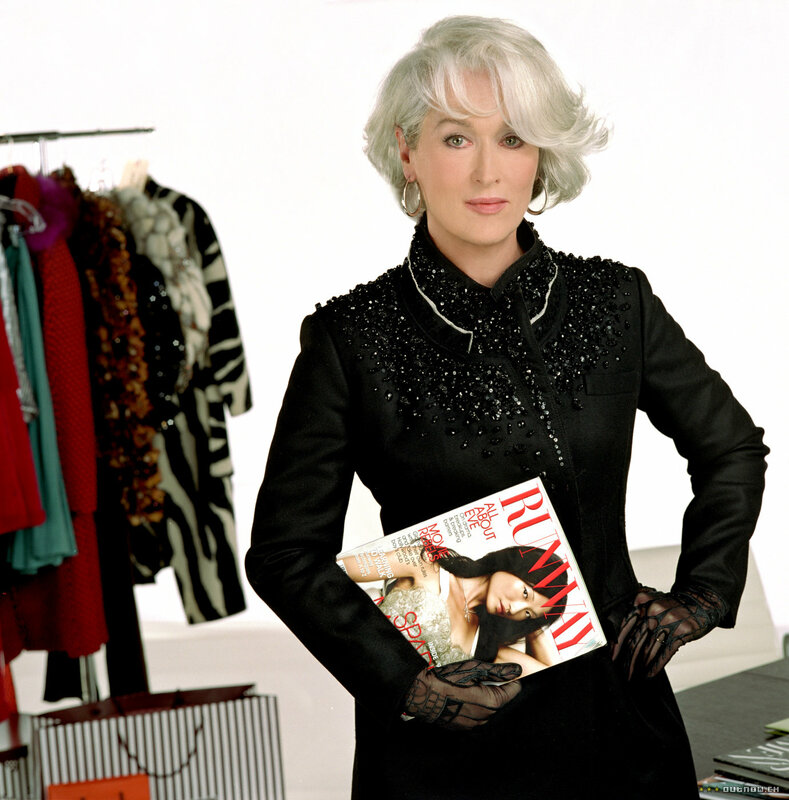 Rarely, do I enjoy a film adaptation as much as I enjoy a book; however, “The Devil Wears Prada” is a notable exception. Acting aside (Meryl Streep can do NO wrong! ), the killer fashion, impeccable styling, cameos by fashion royalty (Valentino! Heidi Klum! Gisele! ), and endless potent quotables (“gird your loins!”) make this film a must-see for every fashion girl and boy! And those icy stares and biting lines from Miranda Priestly are simply icing on the cake. On any given day, my top three fashion movies could change order. This is another film I have watched several times and each time I watch I notice something I hadn’t seen before. In the same way “The September Issue” follows the making of Vogue’s most famous annual issue, this film documents the story of Bergdorf Goodman – New York’s most famous, iconic and exclusive luxury department store. The documentary covers the history of the store, it’s most famous patrons and most coveted designers. As a special treat (and my favorite part of the film) the film also captures the process of designing and implementing the store’s famed holiday windows. By the end, you too may want your ashes scattered at Berdorfs. Bonus points if you read the book too! How an you not love everything about Holly Golightly and this movie? The pearls, the sunnies, the LBD, and NYC as the other main character. I could watch this film over and over and over. And truly, has there ever been a more iconic opening scene? In the fashion world, I think not! Don’t Tell Mom the Babysitter’s Dead – a cult classic with fantastic fashion to boot! Zoolander – 1 part spoof, 1 part side-splitting comedy, 1 part blue steel, ALL parts wonderful! After making this list, I realized I could add about 15 move movies to this list. Perhaps, a second list is in order!